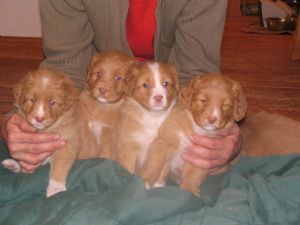 Can you say “Nova Scotia Duck Tolling Retriever” three times in a row?! 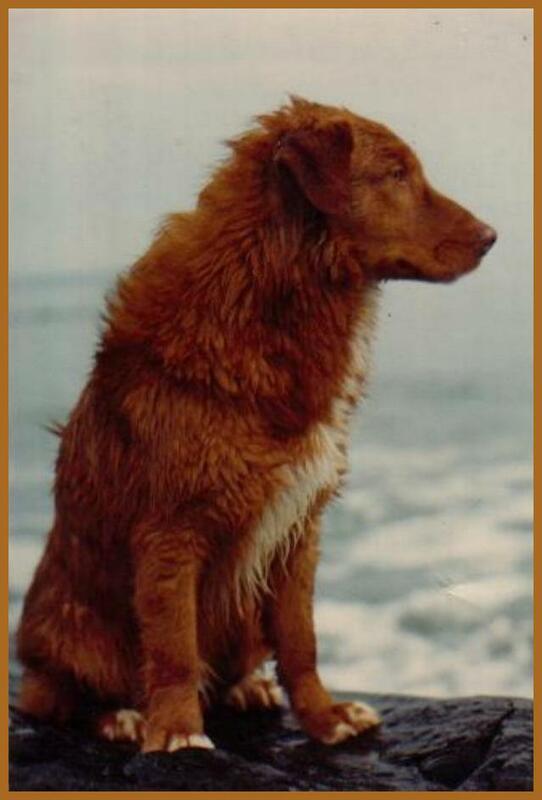 Perhaps that’s why this majestic red dog is also called the Toller for short. 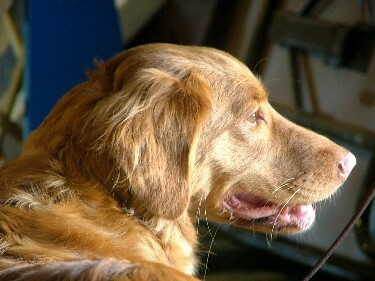 This mid-sized hunting dog, with their hardy frame and lustrous coat, is often mistaken for a small Golden Retriever. 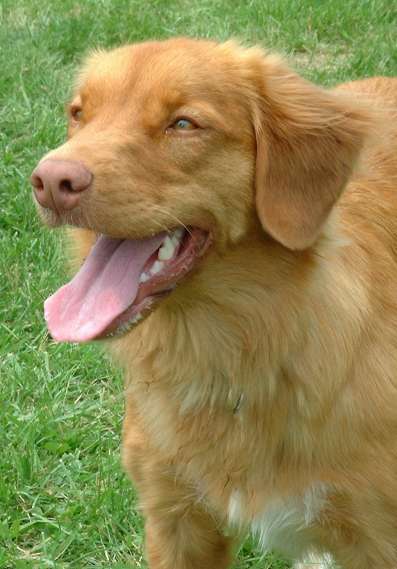 Both breeds of dog share an affinity for the outdoors and can often be seen sporting that trademark retriever grin! 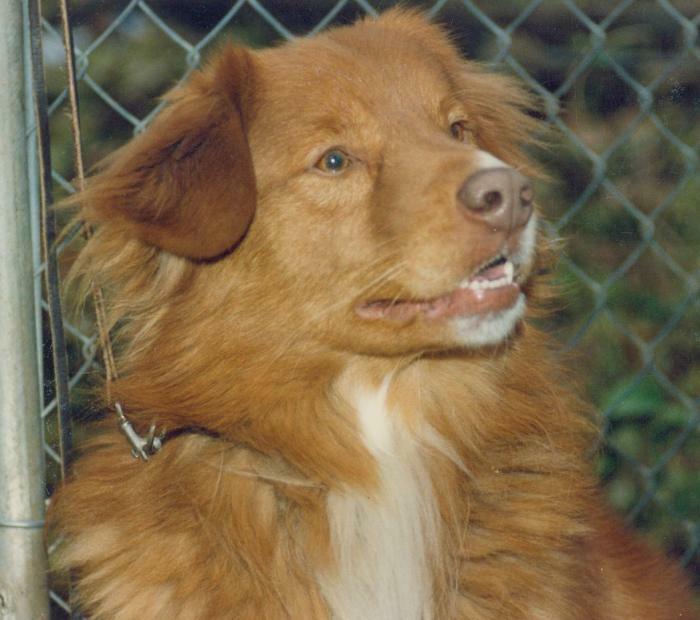 The AKC breed standard for the Nova Scotia Duck Tolling Retriever defines a muscular, yet compact dog with a predisposition for athletics — tolling in particular. 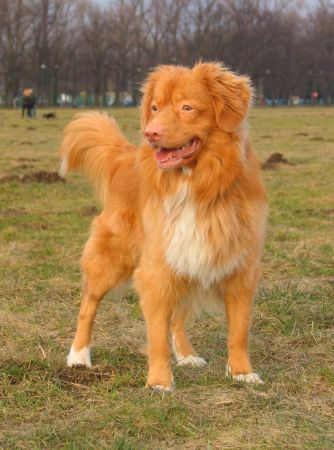 The Toller is an intelligent and high-energy breed, which means they are not suitable for owners who want a chill couch companion. 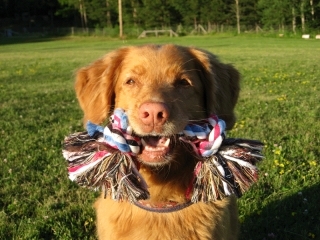 The Nova Scotia Retriever is loving and affectionate, so cuddles aren’t out of the question, but make sure you can provide rigorous exercise on a daily basis! 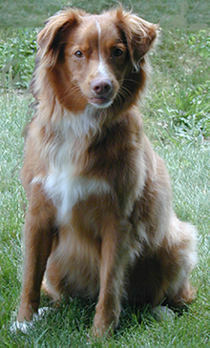 The Toller has fine, foxy features with triangular ears that sit far back on the wedge-shaped skull. 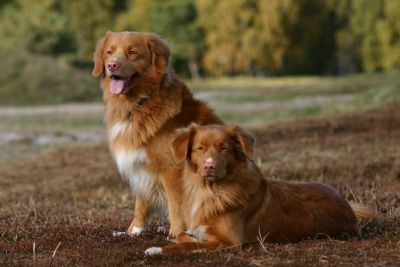 Although at first glance you may assume the Toller is a beautiful golden shade, the breed actually comes in several shades of red, usually with several white markings. 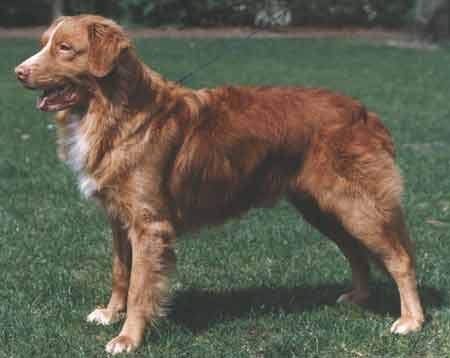 The Nova Scotia Duck Tolling Retriever was bred as a water dog, and the paws are slightly webbed. They have a double-coated, waterproof coat which may have a slight wave along the spine, but it is usually straight and mid-length with light feathering on the tummy and tail. 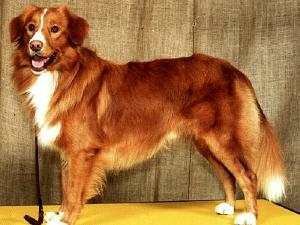 Height (Male) 18 - 21"
Common Misspellings Nova Scoshia Duck Toling Retriever, Nova Skosha Duc Tolling Retreiver or Nova Scoatia Duck Tolling Retriever. 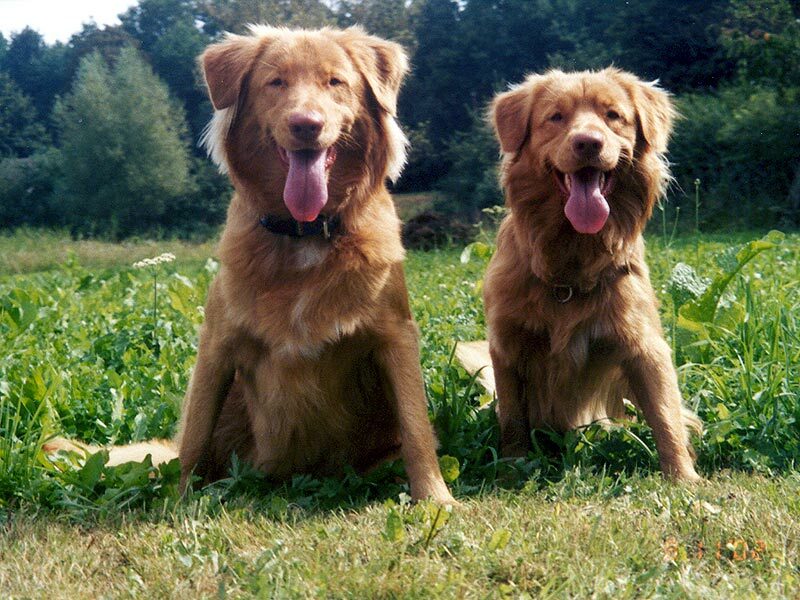 Those familiar with Golden Retrievers may be surprised at the Tollers seemingly inexhaustible well of energy, which is evident from puppyhood well into middle age! 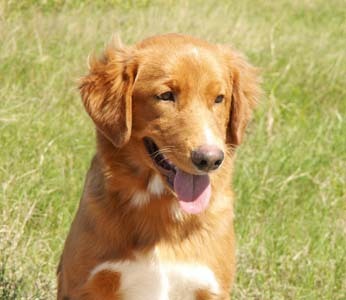 Nova Scotia Duck Tolling Retriever puppies are extremely social, and Toller owners should ensure that they meet their puppys socialization needs by frequently introducing them to new people, dogs, and situations. 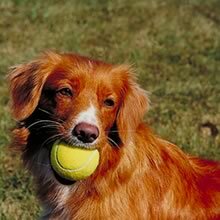 The curious and alert Toller Retriever will thrive in such settings, especially if theres a game of fetch involved. 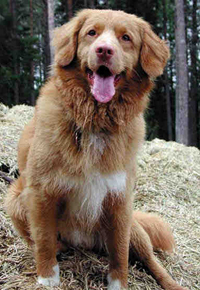 Outside of their propensity for energetic hijinks, the Toller is also a sweet and affectionate dog who will happily sleep on your feet after a long adventure. 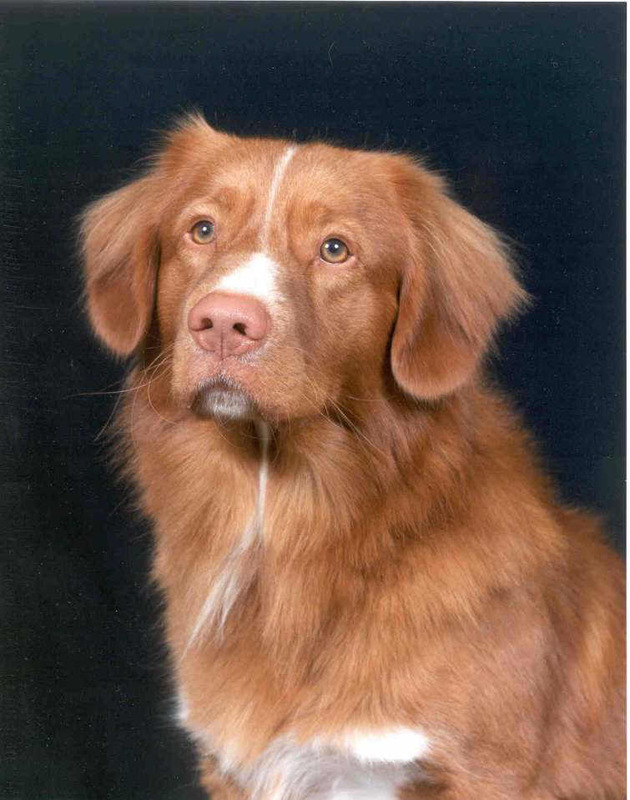 Loyal and obedient, the Nova Scotia Duck Tolling Retriever will be a delight for active families. 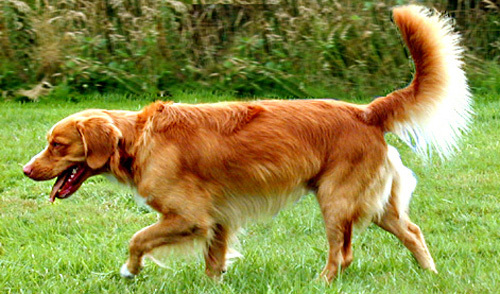 Expect to play fetch for hours on end, and even after that, your Duck Tolling Retriever may still want to do another lap around the duck pond! 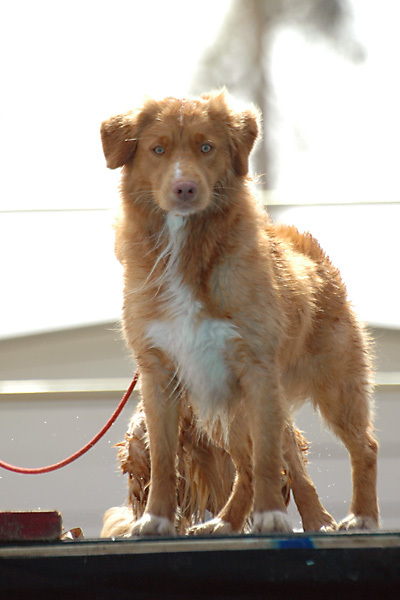 Due to that double coat, the Toller is a great swimmer and will love splashing around in the water. These dogs are shedders, and daily brushings will help keep the indoor furballs at bay. 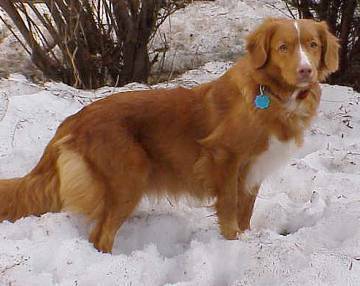 In general, this redheaded beauty is a healthy breed, but you should always research Nova Scotia Duck Tolling Retriever breeders to ensure youre adopting from a healthy bloodline. 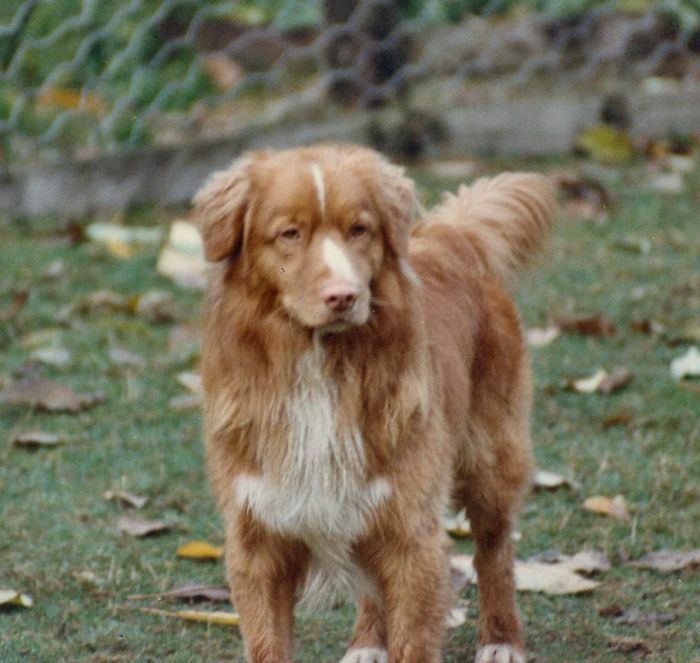 Compared to other dog breeds, the Toller breeding community is small, and breeders often work together to only breed the healthiest dogs. But what is tolling?Tolling is using a dog to lure out waterfowl. 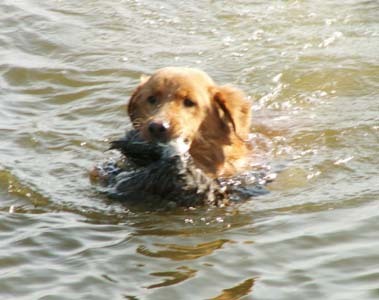 The hunter throws a stick for their Nova Scotia Retriever, who jumps into the water and starts splashing around. This arouses the curiosity of ducks and geese, who come to investigate the commotion. 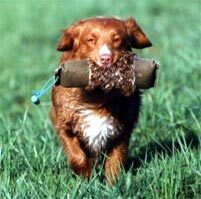 The hunter shoots the birds, and the Toller retrieves the carcass. 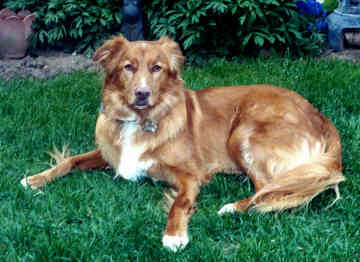 As the name might suggest, the Nova Scotia Duck Tolling Retriever was born in Nova Scotia during the early 19th century. They were bred to assist hunters. 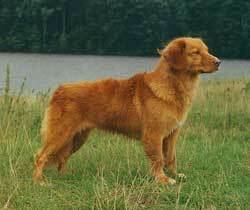 In the breeds early days, this dog was also called the Little River Duck Dog and the Yarmouth Toller. 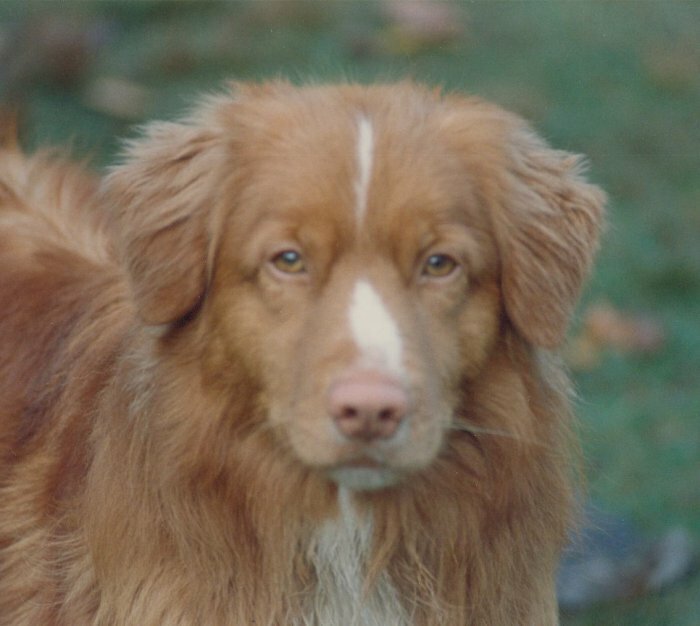 Although its genetics are somewhat of a mystery, its believed to be a cross of several different dogs with an aptitude for hunting, including spaniel breeds, pointer dogs, and, of course, retrievers. 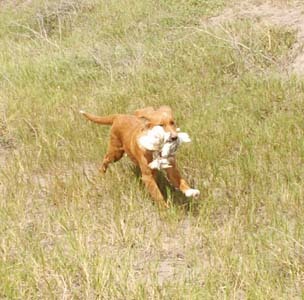 Even the herding Collie went into the mix, all to improve this dogs ability to herd and hunt. 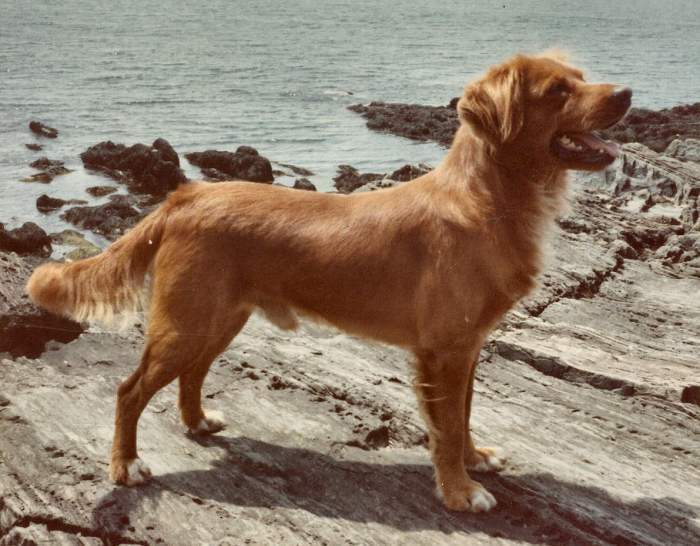 The Nova Scotia Retriever entered the Canadian Kennel Club in 1945, but the breed was not recognized by the AKC until 2003. 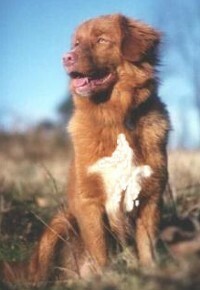 In 1995, the Toller was named the official dog of Nova Scotia.